Starting Wednesday 10/14, there is a buy 3, save $3 sale! 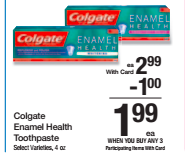 Colgate Toothpaste is part of this deal and end's up being FREE! !